"Dr Palmer Takes over Herbert Irwin's Case"
who is married to a doctor...and likes it!" In The Doctor's Wife, Doctor Dan Palmer and his supportive wife Julie live and work in a small town full of big personalities in this short lived old time radio soap opera. The Doctor's Wife stars Patricia Weil and Donald Curtis as Dr. and Mrs. Palmer. Most of the Dan and Julies tribulations surround interpersonal struggles between the couple and their family, friends, and enemies. There are often telephone calls between Julie and her doctor-husband as Dan has to explain that he will be late… again. 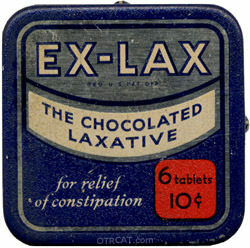 Sponsored by Ex-lax, "The next time nature forgets, remember Ex-lax, the easy was to take a laxative." The commercials in The Doctor's Wife advertise that doctors refer their patients to Ex-lax. Be the first to comment on "Doctors Wife"